Years pass, wiping out the people and the city. Where once was a mountain range stretches desert today. Built on the site of the plains city, and old villages mercilessly flooded. So vanished Atlantis kanuv for 1 night in the ocean depths. Meanwhile, a mysterious island is not the only one who suffered a sad fate of being flooded. 1300 years ago, 290,000 people inhabited the Chinese city of Lion City, located in the suburb of Chun'an County. Today town were flooded, writes Avivas.ru. 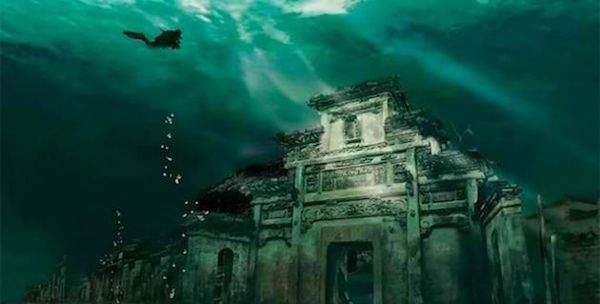 Chinese Atlantis was discovered in 2001 at the bottom of Lake Qiandao on depth of 40 meters. The value of the city is 62 football fields. Many of the buildings are so well preserved that archaeologists just shrugged. It's like you had to build that cement can withstand long-term pressure of the water, without destroying it. Moreover, survived even the wooden beams holding the roof gazebos and summer terraces. For the first time, the Chinese organized expedition into the flooded city. For these purposes, was built a special submarine length of 23 and a height of 3.8 meters, which put the 48 passengers and crew members. But archaeologists after several expeditions banned visiting tourists, referring to the fact that such events can damage the ancient buildings.